One of the more puzzling pieces of the real estate process is actually part of the financing process: appraisals. Appraisals are without a doubt confusing, yet they are a key part of the mortgage loan underwriting process. As a home buyer, it’s important to have a basic understanding of their purpose and how they can affect your transaction. 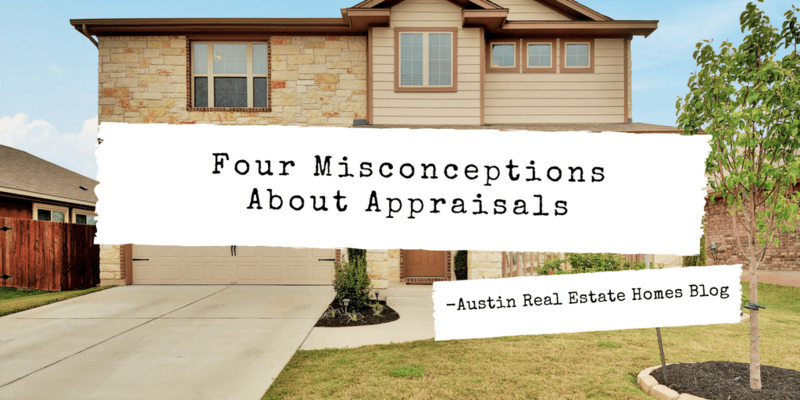 Below are four of the most common misconceptions about the appraisal process. Appraisal are ordered by and for the benefit of the benefit of the Lender. This is confusing because the borrower pays the cost, but remember that the borrowers pay all of the lender’s costs. Since the lender hired the appraiser, the appraisal belongs to the lender. So it’s the lender who is the client rather than the buyer even though the buyer pays for the service. Under today’s underwriting rules, appraisers are prohibited from speaking to the buyer. The buyer may communicate with the appraiser only through their lender. The lender is required to give the borrower a copy of the appraisal. The lender’s purpose for obtaining an appraisal is to answer the question: is there adequate value in the property to justify making the loan amount requested? This is equivalent to determining if your collateral is worth the amount of money you need. Let’s be extra clear on this point, the appraisal does not justify sales price. The appraisal is an unbiased opinion of the value of the property as of a date certain for the very specific purpose of securing a loan for the property. In other words, the appraisal will not necessarily show home buyers whether they have over-paid or gotten a “steal”, but rather assist the lender in determining if the property is worth at least enough money to cover their loses should the buyer default. In fact, it’s said that some lenders have instructed appraisers not to appraise the property for more than the sales price even when the property is worth more. Appraisals are, by nature, a detailed analysis of the local market on a certain date. All of the physical characteristics of the subject property are factored in and compared to other similar properties. The appraiser does observe the apparent condition of the structure, system and physical components of the property, but doesn’t perform an in-depth analysis as would a home inspector. Clear indications such as a roof leak or structural failure would be noted and probably affect the final value. But, do not expect an appraisal to provide you with a comprehensive evaluation of the property’s physical condition as that is beyond the scope of the appraiser’ s job description. Houston appraisals can accommodate most real estate valuation requirements. Appraisers are simply a snapshot of value at a given moment in time. Appraisals do not project future value, or changes in market conditions. Their methodology is simply not designed to do that. Changing the purpose or date will likely change the value of the property in question. It’s important that buyers not use them as an indication of future value. We can help! We specialize in Home Buyer Representation and have helped hundreds of buyers over the years buy real estate in competitive markets like Austin. If you’re looking for a Realtor who will negotiate hard on your behalf and help guide you through the process, call us at (512) 827-8323 or email us at info@11OaksRealty.com to schedule a no obligation consultation. Remember, buyer representation is paid by the seller and it costs buyers nothing!